Conor Mcgregor and Khabib Nurmagomedov made weight on Friday morning (Oct 5th, 2018) and went on to face off the same evening at weigh-ins Ceremonial event in front of large crowd. As expected the staredown between two stars was intense and UFC head honcho Dana White tried hard to prevent something nasty fall from breaking out. 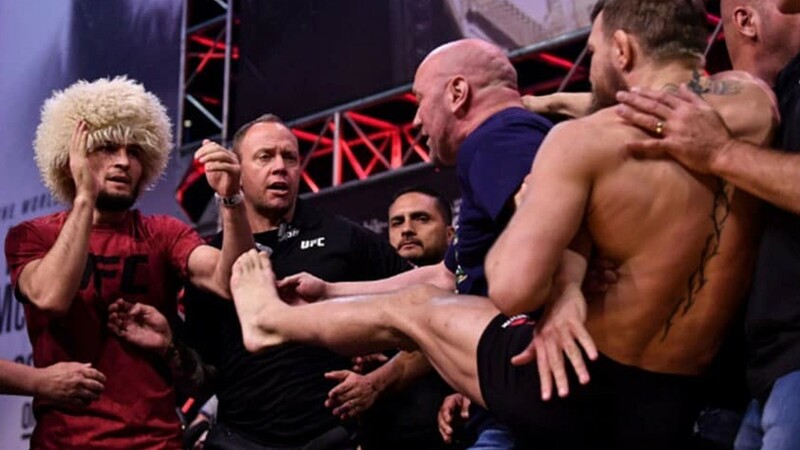 However, Mcgregor didn’t listen to company head and slapped Khabib’s outstretched hand, White separated them, at last Irishman threw a kick at ‘Eagle’ though Russian was safe as he was at some distance. Following a brief scuffle, Joe Rogan went on to interview Conor Mcgregor, who said to Rogan don’t interact with Khabib. Then next Khabib, who thanks all Irish fans in the crowd, then warned them what he’d do to your boy. UFC 229 PPV event is set to take place at the T-Mobile Arena tonight Saturday, October 6th with the main event start at 10 PM ET/7 PM PT.